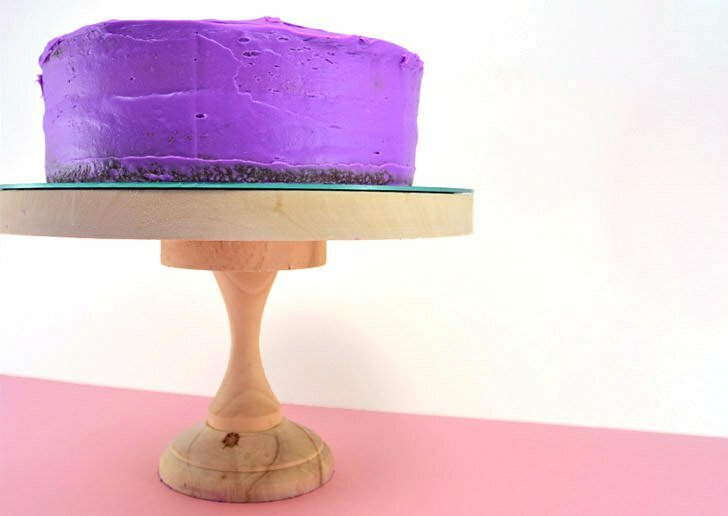 Any cake looks even more impressive on a mirrored cake stand! See how to make one that is the perfect size for the cakes you bake most often! Right before Christmas, I decided to treat myself to a cake stand when I was pushing my cart through Walmart. “Handmade!” The box said and I was super stoked at the super simple design and pretty but innocuous mint green color that would “go” with lots of the stuff I already have in my kitchen. Box of cake mix on the counter I decided to remove my cake plate and get it all washed and ready to go. But I quickly realize something is wrong as I tip my head left and right while it sits on the counter. This sucker is straight up uneven. Like, a 20-degree angle of wonky and I have no clue how it got past quality control. A vision of a prettily iced cake slowly sliding off of the thing hits my brain and I’m hacked. No cake today. And then one day I’m strolling through Michael’s and it’s one of those times where I’m not there for me and I don’t actually need anything. Which is always feels so odd as I almost always NEED something crafty :) Armed with a 50% coupon and no plans I stumble through the woodworking section and come away with 3 items and a plan to make a cake stand. Boom. Right on out of nowhere. 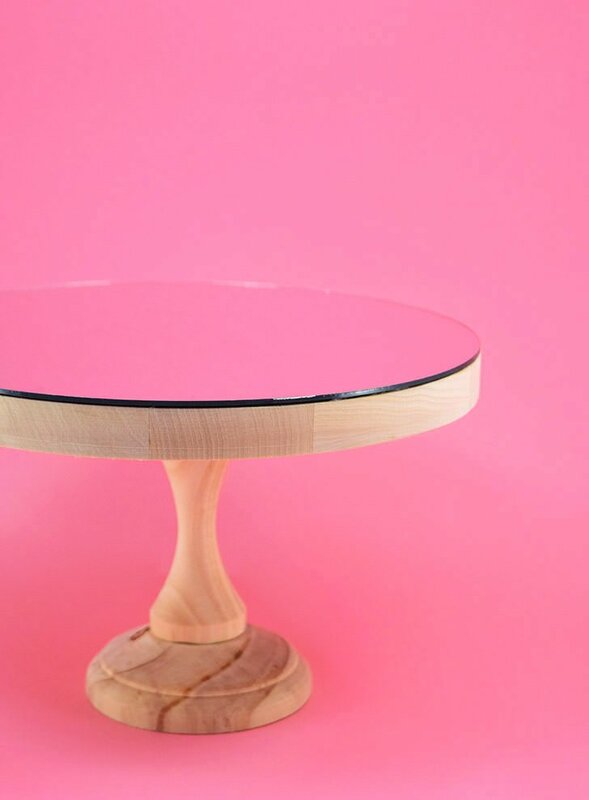 And when I got home I made a simple, but I think really pretty cake stand that will go with everything in my kitchen and fit in with any kind of cake design for any holiday because it’s even more innocuous than my mint green store-bought jobby. 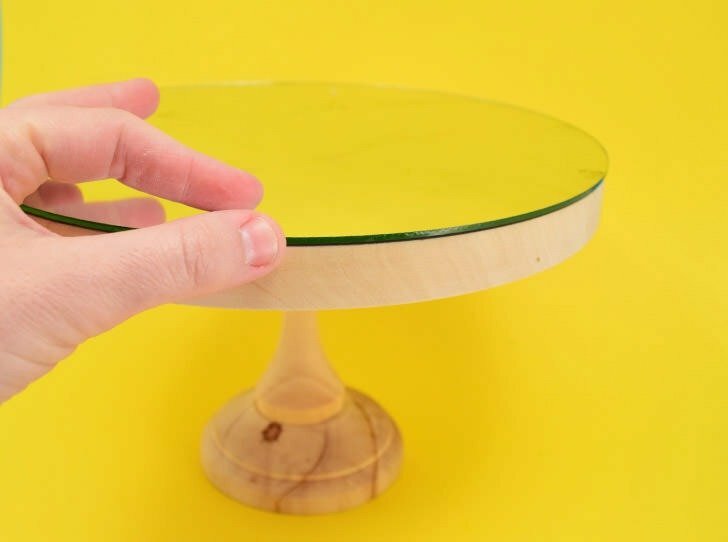 Want to make your own surprisingly strong mirror cake stand? First things first you’re going to need a wooden pedestal. I found these in the wood section at Michael’s. 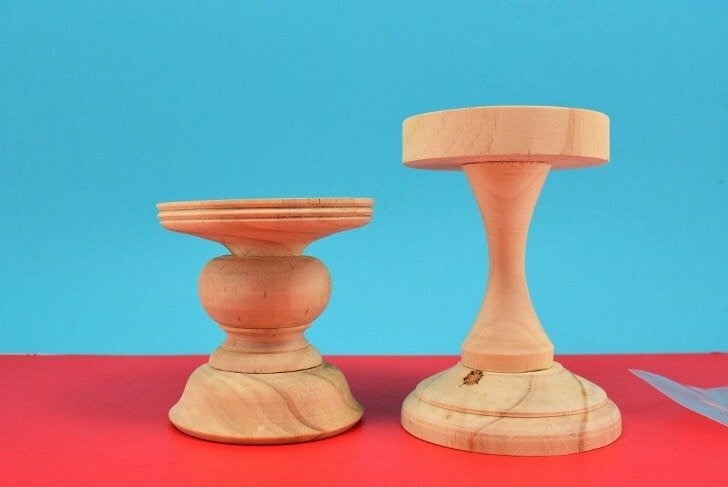 Unfortunately, not all pedestals are made equally. I bought the one on the left first because I have this thing with short, squat stuff. Which totally is why I love the artwork of Fernando Botero. But it turns out my little fat guy on the left was way crooked. Not as crooked as my returned to the store premade jobby but pretty darn close. On returning to the store I straight up went through every wooden pedestal they had, placing them on a flat surface because the vast majority of them weren’t as level as I needed for a nice cake plate. As such, though I totally dig the convenience of shopping online, I’d strongly recommend going in store and picking out your pedestal (or a wide candle holder would work, too). 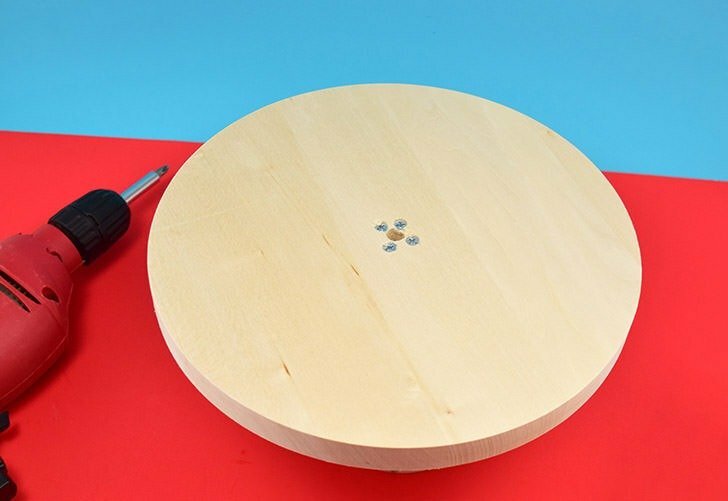 In order to make this cake platter super sturdy, we’re going to use both a strong glue and wood screws to keep it together. 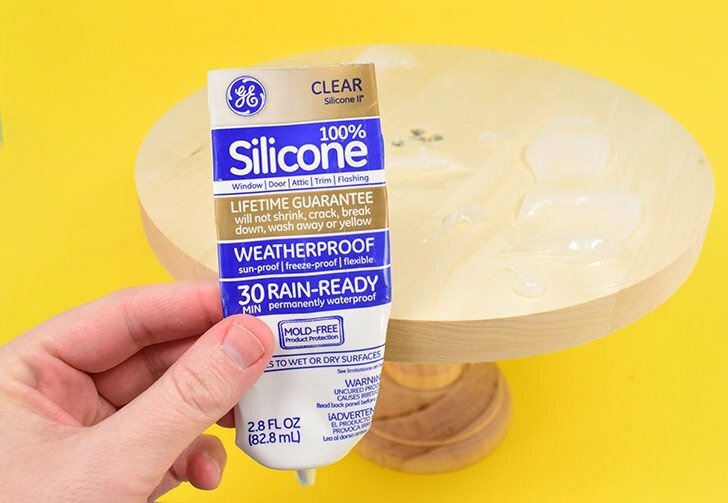 Apply a healthy amount of sturdy glue to the TOP of your wooden pedestal. Place the glue side down onto the back side of your clock face or plaque. I went with a really simple clock face because the hole used for the mechanism and hands will be covered anyway and I like the smooth edge better than a beveled one for a more modern look. 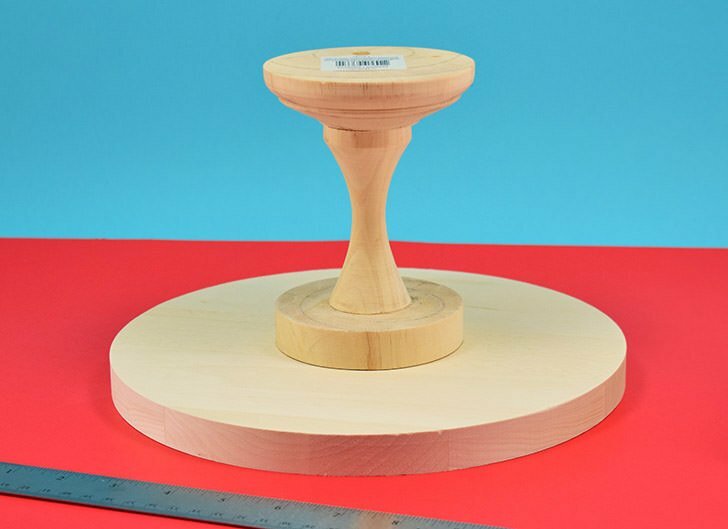 Center your wooden pedestal in the center of the round and place accordingly. Stand over and make sure it appears to be centered or, if you’re more of a perfectionist, measure around the sides to ensure it’s well placed. Leave your stand 20-30 minutes for the glue to slightly cure. Once time is up flip that sucker over and pre-drill holes a bit smaller than your wood screws through the clock face/plaque and into the pedestal itself. These pre-drilled holes will prevent your screws from cracking and splitting the wood, FYI. Attach the 2 pieces together permanently by screwing them together. Also, FYI, I went kind of nuts with 4 screws but 2 would have been ample. Sometimes I’m like my dad who is an awful lot like Tim the Toolman Taylor. Aeuhhh. Now you’ll need to protect the wood with several coats of varnish. I straight up went crazy and sprayed mine with poly a few times a day for 3 days. You want to be sure to get EVERYWHERE so that the wood doesn’t take on water when you wash it in the sink. Wouldn’t that be a drag? You still won’t want to leave this sucker soaking in the sink, but if you give it a quick was you’ll be golden. Now we’re going to adhere the mirror onto the top of the wooden stand. There are glues made specifically for mirrors but they can get expensive. And there’s an awful lot of them in a tube and it’s not something I’m doing all the time. Gluing mirrors, that is. As such I wanted to use something in my stash, and I actually used the last of my 100% clear silicone. Now I used this on a hunch because I was desperate to not have the mirror pop off with cold in case it needs to go in the fridge or heat and moisture when washed in the sink. Because I straight up was terrified of the mirror sliding off into the sink and breaking and me slicing the living daylights out of myself because that’s the type of thing that would totally happen to me. Since silicone tends to give me this crazy hold on just about everything (seriously, I’m becoming obsessed) it seemed like a good option to try. And after the fact that this sucker withstood 350 degrees for about 5 minutes, well, I’m thinking silicone as the adhesive was a darn good call. They sell this business at the hardware store and at Walmart, too. 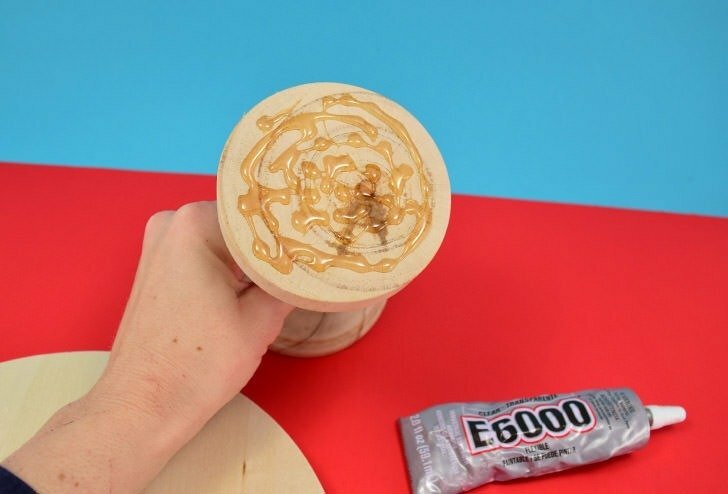 You can buy a huge caulking tube or these much more convenient for the home crafter’s purpose, 2.8 FL OZ squeeze tubes. 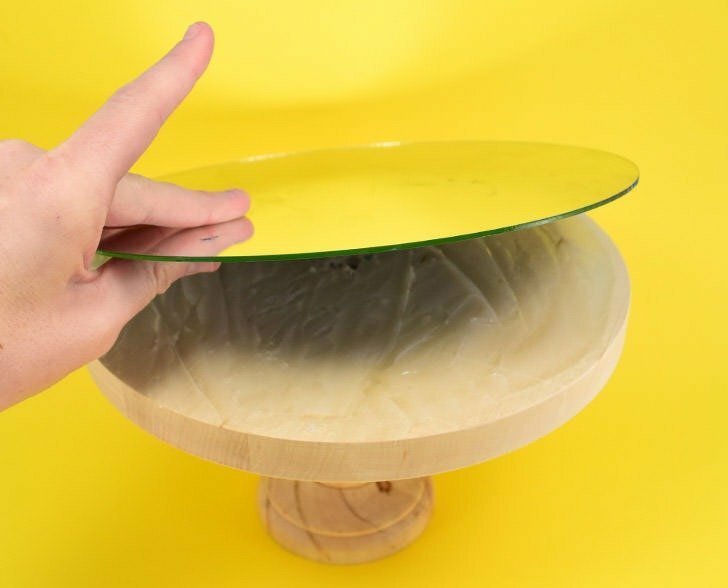 Apply a fair amount of silicone to the top of the stand and then carefully place your mirror on top. Make sure it’s well centered with no part of the mirror hanging off of the sides. Apply a bit of weight (4 cans of veggies worked well for me) on top and allow to dry, at least overnight. And once you start using this sucker HAND WASH ONLY. 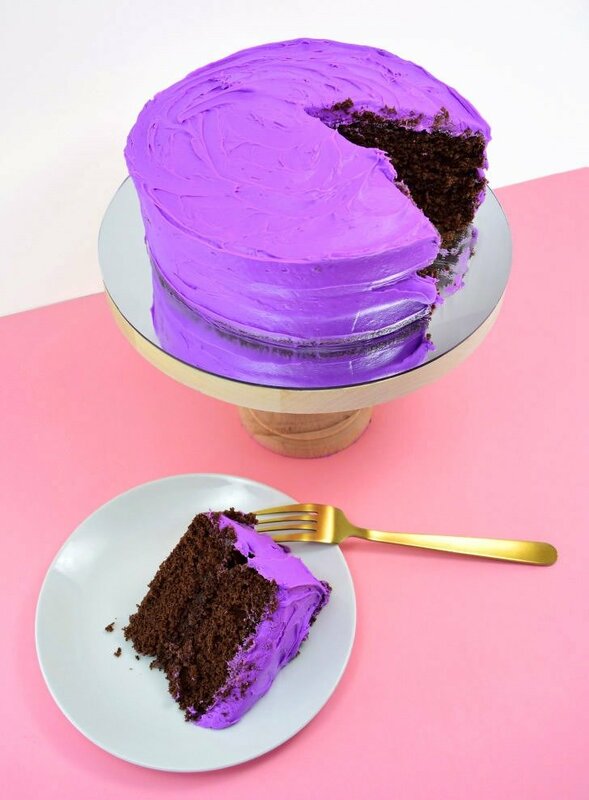 While I love the look of a fancier cake on this stand, it does a plain ol’ purple iced chocolate cake just as well. p.s. check out my awesome knife. 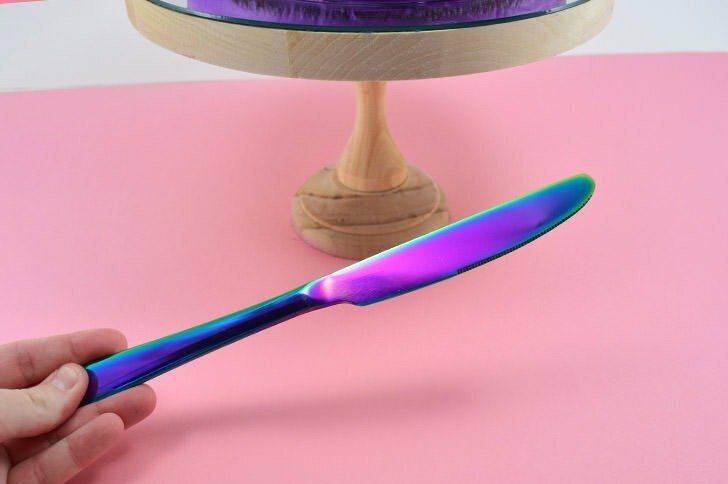 I got it as a technicolor flatware set with spoons and a fork but I’ve lost the fork. I thought it looked awesome online in the pic but I was sure it was doctored so I only bought the 5 piece to see if it really was all crazy colors. I’m planning on grabbing a full set. I know my sister did within minutes of me texting a picture of them when they came in the mail. So cool, right? In all honesty, I had strongly considered painting my stand that pretty mint green shade of the one I had snagged at the store. But in the end I decided I liked the simple bare wood, kind of hygge thing going on. What do you think? 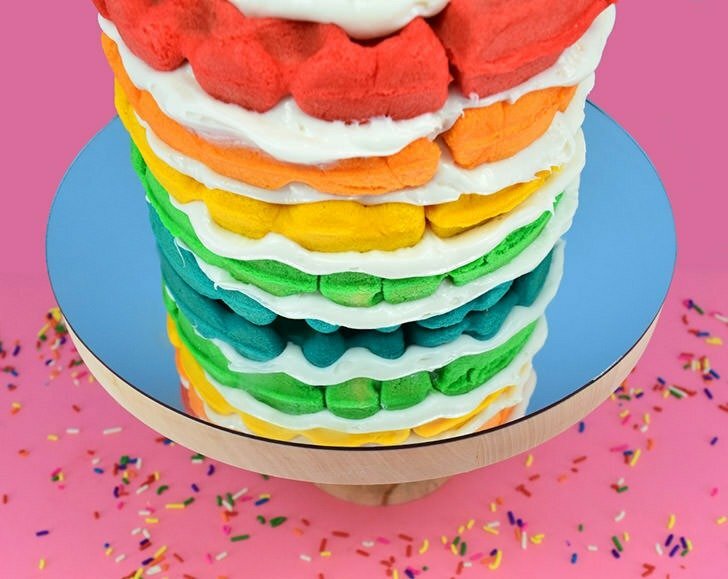 While I like it with a simple cake on it, I LOVE it with a fun colorful cake, like this DIY layered rainbow cake made using a waffle maker! Isn’t it fun how the rainbow layers look like they go on and on for days? And if you’re wondering, I really don’t think that glass cleaner is food safe, but luckily vinegar is! After washing you’re likely to have spots where your water dries so to get that perfectly smooth and clear mirror shining, just take to it with a more coarse paper towel or even straight up paper and vinegar for a flawless finish!